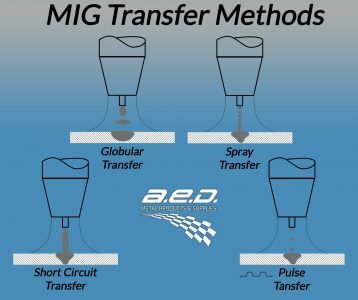 In a previous post, we discussed how the tensile strength test of the “weld metal” would generate the same result regardless of using MIG or TIG welding techniques. This assumes there are no weld defects in either method. The operational control and the skill of the operator make the difference in the welds. While TIG offers the greatest control, it not always the right method for every shop or every build. Be sure to understand where and how typical weld defects occur before choosing between the MIG or TIG processes. 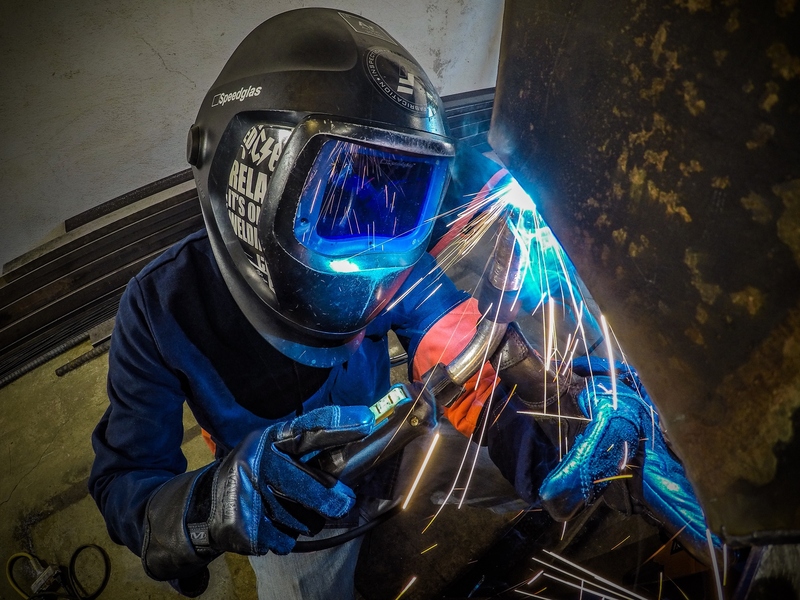 Typical weld defects found in MIG welding are lack of fusion and penetration, craters and cracks, undercut, burn-through, and porosity in the weld metal. These defects can be caused by several factors, such as wire feed speed, travel speed, improper voltage, improper shielding gas, improper shielding gas flow rate, along with defects that occur from improper welding techniques, inadequate weld preparation, and defective equipment. We will detail some of the aspects of each below. The starting and stopping points are common areas for weld defects to arise. Lack of fusion sometimes referred to as "cold lapping," occurs when there is little or no union between the weld metal and the base metal. This is normally caused by lack of heat input at the start of the weld. One way to correct this is by striking the arc slightly ahead (about 1.5 times the weld size) of the desired start point and quickly backing up to the desired start point. Lack of fusion commonly results from poor welding techniques. 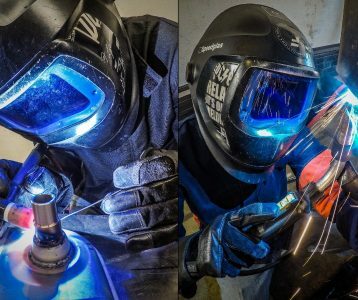 Downhill progression welding can also cause weld defects especially on thicker materials and occurs when the weld puddle gets in front of the arc. Craters and cracks can occur at the end of a weld stopping point. This can be counteracted by welding to the desired stopping point and then slightly back (about 1.5 times the weld size). This will fill the groove or crater in the weld while also slowing the cooling rate by extending the coverage of the shielding gas. Undercutting is a groove or crater that occurs near the toe of the weld. When this weld flaw occurs, the weld metal fails to fill in that grooved area, resulting in a weld that is weak and prone to cracking along the toe of the weld. Excessive heat, as well as poor welding techniques, can both lead to undercutting. Burn-through occurs when the weld metal burns through the base material. This defect is normally caused by excess heat input. Which can also cause other issues such as an increased "heat affected zone" (HAZ), even where burn through is not present. Increased HAZ can diminish the strength of the material. Finally, porosity in the weld metal occurs when gases become trapped in the weld metal or along the surface. This can cause weak welds. Porosity can be caused by several variables such as contamination in the atmosphere or the base material, defective equipment, inadequate gas flow (too much or too little), or an improper welding technique. 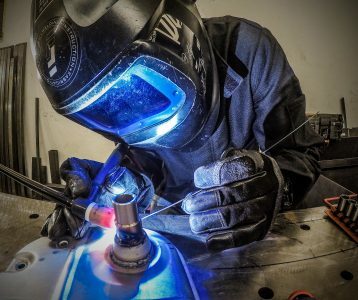 Porosity can be common in MIG welding because of the fast travel speeds and relatively small nozzles which can result in compromised shielding gas coverage. Weld filler metal selection can help in eliminating porosity depending on the percentage of deoxidizing elements and base metals being welded. We would like to credit Brett Baer from SSAB for his help on this posts technical information. Check out our other articles on MIG and TIG welding and welding procedures below. Sign up for our monthly newsletter below to stay up to date with articles like this one from A.E.D.! MIG and TIG welding are two of the most common methods of arc welding ... View Story Created with Sketch. In MIG welding, there are four different basic modes to transfer weld ... View Story Created with Sketch. In a previous post, we discussed that TIG welding allows the operator ... View Story Created with Sketch.